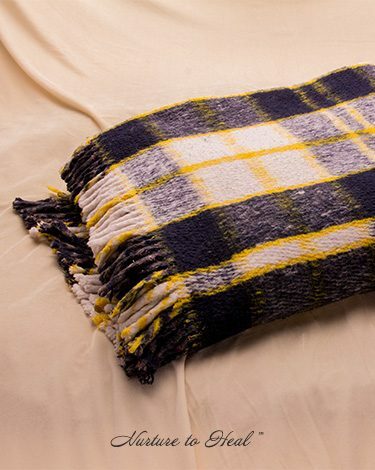 Our Blankets are loomed in Mexico and carefully chosen with nurturing support in mind. They are thick, soft, and heavy so that they can serve a variety of functions ― support, bolster, protect, buffer, shield, or give refuge. The blankets can be rolled, folded, draped, and tucked to customize supporting the body in various ways: for example, folded they give just the right resilient support, rolled they provide the safeguard needed for our nurture surround process, and of course they are warm and cosy when comfort and security are called for. Due to the recycled content colors may vary. Contents: Our Nurture Blankets are made of 100% eco-friendly recycled fibers. The Recycling Process: Fabric for the blankets is sorted by color and put through three different shredding processes that reduce it to fibers about an inch and a half in size. The fibers are then spun into a yarn that is woven into blankets. 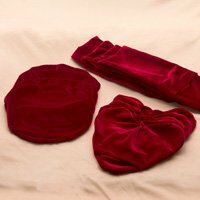 What Makes the Blankets so Thick and Soft? Our heavy blankets are very tightly woven. The secret to their softness and thickness comes with the last manufacturing step before they are cut to size: the blankets are put through a roller machine that pulls the fibers apart on both sides at the same time. This unique process makes them specially soft and thick. Blanket Colors and Patterns: Because the colors of recycled fabrics vary, blanket colors and woven plaid patterns never repeat exactly. Each lot is different and each blanket unique and reversible. Although the quality is consistent, we cannot order specific colors or patterns and never know ahead of time what a shipment will contain. Maintenance: The blankets can be machine washed on a gentle cycle in warm water and tumble dried on a low cool setting. They become softer with each wash.